Apple's OS X El Capitan in October got off to the fastest-ever one-month start for a Mac operating system. El Capitan, also tagged by Apple as OS X 10.11, was released on the last day of September: 31 days later it had been installed on another 25% of all Macs, bumping its total to 27%, according to U.S. analytics firm Net Applications. The October increase was the largest one-month user share gain by an edition of OS X in the six years that Computerworld has recorded Net Applications' data, beating Mavericks and Yosemite, the two previous upgrades Apple handed out free of charge. Net Applications estimates operating system shares by tallying unique visitors to its clients' websites. In the absence of definitive data from Apple, user share is one of the few proxies for real-world OS X adoption. When the release dates of each edition were taken into account, however, El Capitan's average daily adoption rate only edged Yosemite's and turned out to be lower than Mavericks'. Those forerunners launched in the second half of October in 2014 and 2013, respectively, and so spread their biggest gains over a longer stretch than El Capitan: 41 days for Mavericks and 47 days for Yosemite. Not surprisingly, the majority of those who migrated to El Capitan came from its immediate predecessor, Yosemite. Last month, Yosemite shed more than a third of its user share as its users upgraded. But other, even older versions of OS X also lost user share last month. Each of those tracked by Computerworld -- from 2007's Leopard on -- fell at rates larger than their average decline over the previous 12 months. Mavericks, for instance, fell to 14% of all editions of OS X, a two-point slide that was double its earlier average. 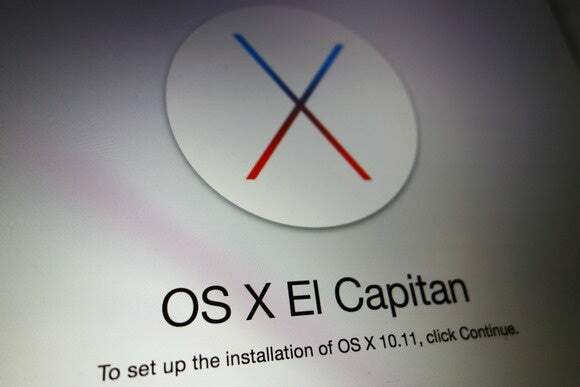 Approximately 90% of all Macs were eligible to upgrade to El Capitan when the operating system launched on Sept. 30. El Capitan will run on the same Macs that have run Yosemite, Mavericks, 2012's Mountain Lion and 2011's Lion. On the flip side, a sizable number of Macs continued to run outdated editions of OS X last month. By Net Applications' data, about 16%, representing one in six Macs, was powered by a version that Apple no longer supports with security updates. Apple distributed the final security update for the three-year-old Mountain Lion in August. It continues to patch Mavericks and Yosemite, however. The one-in-six who run unsupported operating systems seems to be the natural order. Not only has that same percentage of OS X users been on the retired list in earlier years -- even as new editions rolled out annually -- but in the Windows world, a double-digit fraction still run Windows XP, which left support more than a year and a half ago. The free El Capitan upgrade can be obtained from Apple's Mac App Store, and supports iMacs as old as mid-2007, MacBook Pro notebooks from late 2007 on, and MacBook Air laptops from late 2008 going forward. OS X El Capitan beat all predecessors as a quarter of Mac owners upgraded to the latest edition last month.